Visa Approval Letter (VAL) means a visa issued by the Malaysian Representative Office abroad to a non-citizen to enable individuals to enter Malaysia after the visa is approved by the Immigration Department Headquarters. Student pass is a necessary pass to continue study at Malaysia higher education institutions. Dependent pass is a facility provided to students who carry responsibility while continuing their studies in Malaysia. Those who have a new passport, but the visa is still valid in the old passport. Whoever changes or losses the passport, the holder of the passport need to apply for transferring the current pass to the new passport. Whoever wants to change the pass from dependent pass to another type of pass, applicant needs to apply for cancellation of the valid pass. Applicant then can get a release letter from Putra International Centre. International students are responsible for the validity of their student passes while studying in the country. The immigration department usually grants a one (1) year student pass for first-time applicants. Renewal of student pass application is ONLY applicable for Continue Student. The renewal process of the student pass typically takes about eight (8) weeks to complete. Application for the renewal of Student Pass must be made through the Putra International Center 3 months (90 days) before the expiry date. Students who are late in submitting their application for the renewal of Student Pass will be required to pay a penalty. The penalty is imposed by the Malaysian Immigration Department. 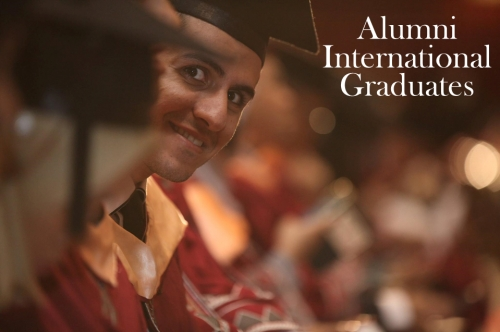 Upon graduation, all international UPM graduates are welcome to join UPM Alumni Association in order to strengthen your global network relation with UPM community from variety of expertise. Since 1971, the UPM Alumni list has grown to an impressive list of 145,000 people - not only in Malaysia but from all over the world, including Asia, Europe, Middle East, Africa, Australia and even South and North America. UPM Alumni has been known for their contributions in their respective fields and they have left a big impact on society and the nation and enhanced the university’s reputation at the international level. For those interested to find out more information about the UPM Alumni Association, visit the Alumni Centre and the Alumni Association Official Website. UPM Alumni Centre is committed to planning and implementing various activities and programmes that engage alumni to maintain a lifelong relationship amongst alumni consistent with the alma mater. Alumni Centre is in line with the university for alumni relations and networks by impementing various programmes to bring alumni back to campus in supproting the university's core functions of teaching, research and professional services. Alumni Association/ Chapters as a strategy to expand UPM alumni network locally and internationally is relevant with the growing need for strengthening university linkages with alumni. To fulfil this purpose, Alumni Centre is entrusted to promote the interest and enhancing the visibility of the university through linkages. Join Alumni Association/ Chapters and reconnect with your friends and former classmates. Alumni Association/ Chapters support scholarships, student's financial assistance, employability of graduates and community services. UPM has numerous linkages and collaboration with outstanding international institutions and agencies around the globe such as USA, Latin America countries, Japan, Korea, the Middle East and others through Memorandum of Understanding and Memorandum of Agreement. Various networking activities have been conducted such as mobility programmes, staff and students exchange, research collaborations, commercialised activities and technology transfer.